I need help again from movie folks. 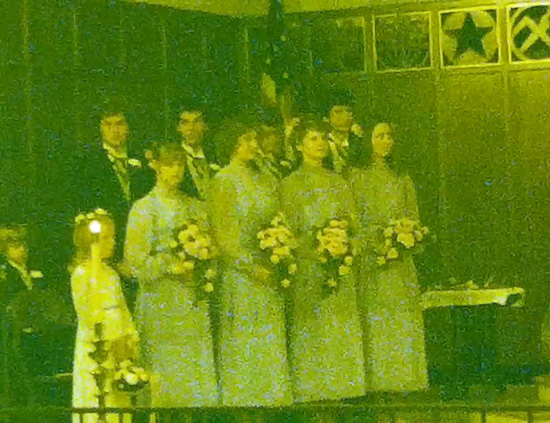 I have come across some greening of color Super8 home movies as I am going through the family collection. These would be from the 1970s. I need to know the best way to clean these. Chemical, mechanical, steam, heat,freeze, something else? I have FilmRenew because a number of the films are brittle and some are creased but I don't think this will clean the green. I still tend to think in terms of still film and magnetic tape and I don't want to do it wrong. Since I am digitizing everything and I can "repair" them electronically but I am trying to preserve the films as well. I'm an amateur noob. Please be gentle. BTW the term "green" film means film that has never been projected. I wonder if this might be a lubricant,as in a wax type substance used to treat new "green " film. I know a green wax was used in cinemas, it was applied to the film whilst wound on a core,before spooling up.ie just to the very edge of the tightly wound film. Perhaps you could post a picture Barbara to illustrate the "green" you are seeing. I'm sorry. This is my fault for not knowing "movie film" language. I mean that the images on the film are turning green. Think about mildew growing on something. It changes the color but you still see the original. I have seen this kind of effect in other medias from both biological and chemical causes. I don't know the cause here. On one roll it occurs at the leader end and that's all. Another reel has it happen at both the leader end and the tail end but most of the film is fine. I haven't finished going through the films to see if there is more yet. It is not stronger at the film edges. It is pale green to yellow-green color most noticeable on white (of course) but can be seen over any color. Thank you for your help. I'm sorry for my confusion. Barbara, I have seen Ektachrome home movie film fade to a mostly green colour image due to bad processing or finishing, although it is unusual and pretty consistent throughout a single roll. Although, from your more detailed description this could be mould on the film, or excess humidity and / or heat adversely damaging the film base or emulsion over the years. Don't forget that cine film was balanced for certain colour temperatures, so that if the film stock was daylight balanced, or tungsten balanced but with the camera's daylight filter in place, indoor scenes illuminated with tungsten or fluorescent light sources could appear excessively yellow or green. Just a thought, but worth considering the image content for clues. - is the dis-colouration consistent over the frame, or blotchy? Do daylight scenes look OK, but indoor ones don't? However, I think Janice is wise to suggest some images before any advice is given regarding cleaning. your question is not stupid and your description now very clear. from what you have said, I don't think my wax theory has anything to do with it. most likely a chemical reaction but I don't really know. Back in the late 1980's, I found a 35mm intermission film(the one with the hot dogs doing a back flip into a bun)in the projection booth of an abandoned drive-in.The film,originally in color, had turned completely green. I kept it for a more than a few years but finally threw it out. I'm sorry about the delay. Things went sideways here. 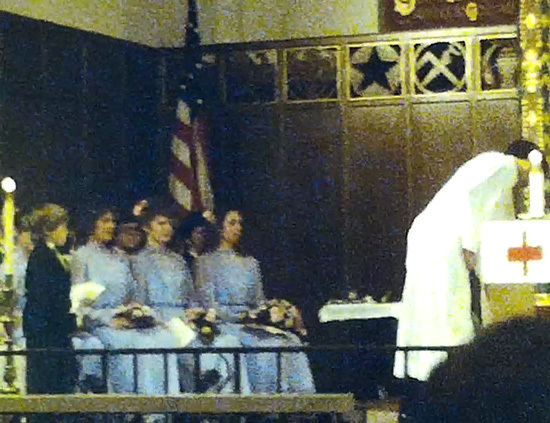 Below are images of two different frames from a wedding film. These are taken from the scan done on the Wolverine. I chose these trying to limit the variability in the images. They aren't the best images but I hope that you can get a sense of what I am seeing. The "green" isn't stronger on the edges of the film but does seem to happen at the beginning and/or end and fade as you get into the reel. To my way of thinking, this seems like something happened during processing or handling not storage. Then over time the whatever slowly became the green that I am seeing. Barbara, your question isn't stupid at all. Post freely on this site and you'll get helpful feedback. I've not seen anything like that before and I've family films shot over 50 years ago on Kodak stock with perfect colour. "There are no stupid question." I'm sorry if I sounded rude, I didn't mean to. I need to "prooof read" what I type a little better. No need to apologize. There are stupid questions. The kids in our family search far and wide to find them. Barbara - What type of film stock was it? When was the expiry date? When was the film exposed in relation to the expiry date? The reason I ask is that I once used some very old out of date/expired Ektachrome 160 that I had obtained cheaply, and the result looked quite a lot like your second picture. I put it down to the fact that the film chemicals had deteriorated on the film surface by the time the film had been exposed and this was the result. The difference between both our situations is that mine didn't go from good to lousy, it was lousy right through from the start. I'm sorry but I don't know how to tell one company's Super8 from another. These films are from the 1970s. I had nothing to do with them until I became the family archivist. I couldn't make any guesses to the age or storage of the unexposed film. Sometimes I can't guess anything about them at all. Some of the films were in the camera for up to a year but I know this wedding film was only in the camera that day. (It is the middle reel of the wedding.) I would doubt the wedding film sat around very long before being developed but I don't know for certain and I have no one to ask. I had some Ektachrome 160 which also looked ok at first but faded to green over a few months. The fade was consistent throughout the reel, but looking at Barbara's images, I would guess that this is Ektachrome which has indeed been badly processed or finished and as a result has sections which have faded certain colours resulting in the green image. So sadly, Barbara, I don't think any cleaning methods are going to help here. As you point out, you can colour correct these digitally, which is good news in this day and age, but as for preserving the original film, I think it will only continue to degrade. Freezing is an option. Sadly, if these films had been Kodachrome the colours would have looked as rich today as when they were photographed, but Kodachrome was a slow stock (40 ASA, so required a lot of light to produce good images). Interiors like the images you have shown would need to be on faster Ektachrome stock to capture decent images in lower light. So at the time it was a very sensible choice. Melvin has a good point as, I have a few very early castle Films releases (one of them being, I believe, the very first, regarding the Hindenburg), and those very early black and white films have actually turned a light purple, film stock wise. Osi, with respect, you are now confusing this post with reference to printed film stock. The post is discussing cameras reversal stock and Melvin is also referencing this in relation to the topic. The only film I had that looked even vaguely like that was very outdated and (home) push processed Ferrania CR25 standard 8. But that had the quirk of extended processing times altering colour balance. Therefore, I mentioned it as the series of posts was about the color change on film stocks, albeit, her film stock has greening and my film stock has, well, "purpling"
I am slowly but surely digitizing all of the family media. This means everyone can easily have a copy. But this has brought me a lot of restoration work. I have left the 8mm movies till last because they are the format I am the least used to. Most of the problems are seen in other media, so I do recognize the issue. This I hadn't seen before and assumed it was my lack of knowledge. Now I guess that I am lucky and found the "real head scratcher". Nobody's mentioned that FilmRenew and other petroleum-based film products are great at killing fungus. And I'll chime in to say that something's definitely wrong with the dyes in that part of your movies, whether a lab defect or something got on the film to wet it over the past few decades. Barbara, do you have a way to magnify the edge of the film? There are usually markings along the sprocket holes that, given a few readings to catch what's missing in the holes, will give you clues as to the identity and date or a date code for the film. Last year, based on recommendations from this forum, I spoke with Mr Urbanski and bought FilmRenew and some supplies that I needed. So every film that I have looked at has been cleaned with FilmRenew. I only have so much space for my hobbies and right now all of my best optics are put away. I did look with my task magnifier and did not see anything on the Super8 film. Would the text repeat the whole length? If it does should it be continuous or periodically like every foot or two?